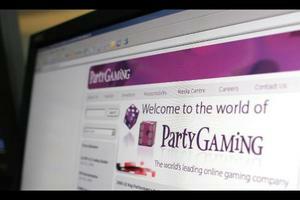 PartyGaming, online gambling network has revealed their figures for the first quarter of the financial year and the insight into the readings doesn’t make great reading for the owners and investors, with figures showing that the average daily revenue has suffered a hit and that their poker aspect of the network seems to be the cause. Overall the company was happy to report that their income throughout the first quarter was in fact up on those of last year, the company seeing an increase of 27% across the complete gaming network. Although the overall figures show that the PartyGaming has been able to record a higher profit, it can’t be ignored that the poker sector of the network actually took a 2% drop in activity compared to the final quarter of 2009. The drop in daily income means that overall the poker sector of the company, Party Poker, only took a total of $47.8 million with previous figures been as high as $53.6 million. A spokesperson for the company told media that the fall in figures was due to a small decline of activity within the ‘US facing sites’. With the drop in poker revenue, the company has moved to prevent the next quarters figures looking so low, announcing that they have added a new online poker room to their network that will focus on providing poker for the French player market. It seems that the first quarter figures for a number of online poker rooms and networks seem to have seen a decrease in profits per day but with the game still strongly attracting new players to the game every day, it will only be a matter of time before the shortfalls are countered. This entry was posted on Friday, May 7th, 2010 at 8:03 am and is filed under Poker Industry News. You can follow any responses to this entry through the RSS 2.0 feed. You can leave a response, or trackback from your own site.